Hyundai launched the Creta in mid-2015 and since then the SUV has been a real number cruncher for the Korean giant. Available with both the engine options - petrol and diesel, the Creta gets eight variants - E, E+, S, S+, SX, SX+, SX+ Dual Tone and SX(O). The Hyundai Creta 1.6 CRDi AT S Plus is priced at Rs 13.7 lakh (ex-showroom, Delhi as of May 9, 2017). The powerful 1.6-litre CRDi diesel engine generates 128PS of max power and 260Nm of max torque. It is linked to a six-speed automatic transmission. With a decent ground clearance of 190mm, it tackles rough roads quite convincingly. However, it isn't meant for off-roading. On the exterior, the automatic Creta diesel gets 16-inch silver alloys, silver painted front & rear skid plate, roof rails, silver radiator grille, dual tone bumpers, body coloured ORVMs and outside door handles, body coloured rear garnish, LED turn indicators on ORVMs and shark fin antenna. The interior too features a host of convenience elements like follow-me home headlamps, foldable key, electrically adjustable ORVMs, front console armrest with storage, rear center armrest with cup holders, electric tailgate release, rear power outlet, tilt adjustable steering, luggage lamp, power windows, room lamp, rear AC vent, battery saver, front map lamp and remote fuel lid opening (cable type). Moreover, you also get height-adjustable driver seat, height-adjustable rear headrest, 7.0 smart audio video navigation system, Bluetooth, Smartphone Connectivity with Android Auto, Apple CarPlay and Mirror link. 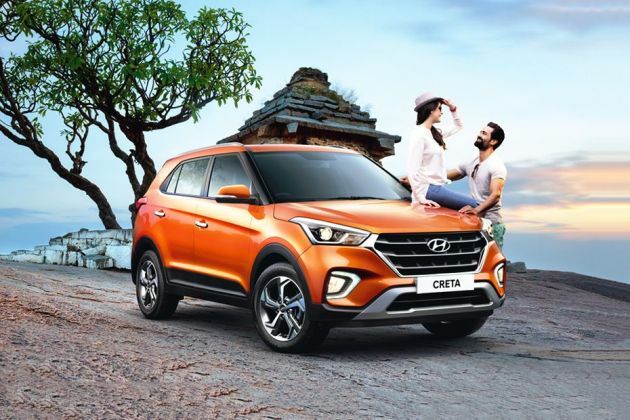 The Hyundai Creta automatic is competing with the likes of the Renault Duster and Ford EcoSport.